The College of Science, Health and Engineering contains nine schools and 16 departments working across La Trobe's multi-campus operations, offering general and specialist undergraduate, postgraduate and research higher degree courses. Our world-leading staff are dedicated to achieving significant educational and research outcomes in their fields. Our degrees are linked to emerging trends and are designed to prepare students for work in changing environments. We deliver a wide range of general and specialist courses that challenge students to expand their life and learning experiences. We are engaged in both regional and metropolitan communities, with our courses offered across the Albury-Wodonga, Bendigo, Bundoora, Franklin St (Melbourne), Mildura, Shepparton and Sydney campuses. Our students have access to world-renowned research facilities including the A$100 million La Trobe Institute for Molecular Science (LIMS) and the A$288 million Centre for AgriBioscience. Infection, Immunity and Cancer Research. 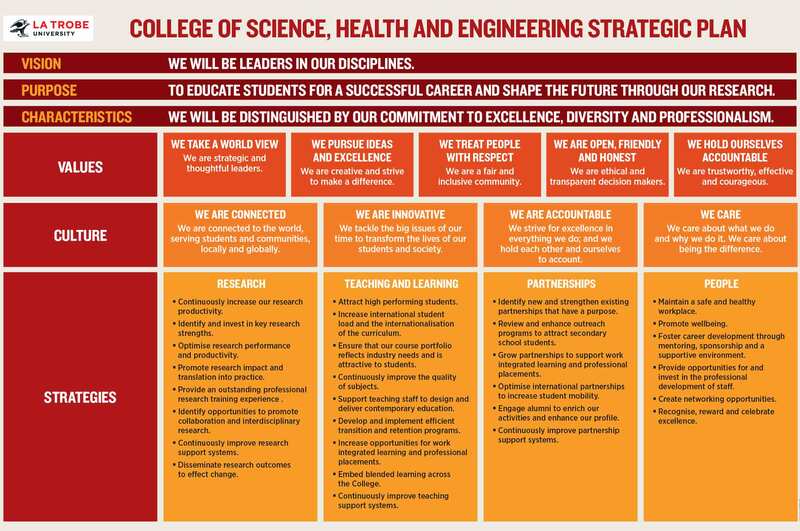 The College of Science, Health and Engineering Strategic Plan [PDF 35KB] sets out a series of core priorities across Research, Teaching and Learning, Partnerships and People. The pursuit of excellence across these four areas is ongoing and is essential to the growth of the School's reputation and resilience.